Our February Twitter avatar chef was chosen by Nancy: James Beard. I really wanted to make one of his yeasted breads (and maybe I still will this month). Before I'd started baking, I'd never heard of James Beard, but once I started baking bread a couple of years ago...well, you can't read about bread for very long without reading about Beard on Bread. But I'd already made a couple of loaves of toast bread (one of Mellow Bakers' February breads), and I've been working on a multi-stage rye, and the sweet recipes on the Beard foundation site just looked so good. And then I started thinking about how long it'd been since I'd baked anything for hubby to take in to work (or for me to take to work, for that matter). And then I saw this snickerdoodle cake recipe. Snickerdoodle coffee cake?? I love snickerdoodle cookies. And my awesome hubby had bought me some Vietnamese cinnamon from KAF for Christmas. I just couldn't get this recipe out of my mind...so I made it! This was so incredibly easy to make, but it seemed like such a tiny amount of batter for a 9x13 pan. Nevertheless, I got one prepared. When I scraped the batter into the pan, I again thought, "This can't be right," so I started googling to see what I could see. I found this post, in which the author claims that there's a misprint in the original cookbook, and the recipe is actually meant for an 8x8 pan. That made me feel much better. And then I read that she added two pears and some vanilla to her recipe...which sounded really yummy. 1. Sift the sugar, flour, salt, baking powder, and cinnamon into a large bowl. 2. Whisk the egg and milk together. 3. Mix the wet ingredients in with the dry. 4. Add melted butter and whisk until combined. 5. Stir in pear chunks. 5. Pour into a buttered 8x8 pan. 6. Combine topping and sprinkle some (most?) over the cake. 7. Bake in a 400 F oven for 25 minutes. That's not the whole reason for the extra time, though, as the sausage only took a few minutes to throw together. It was easy-peasy: ground pork, garlic, salt, pepper, and dry white wine. I'm actually not sure how this recipe could fit into thirty minutes, as there are several steps where things have to cook for 10 or more minutes. But it was still easy and totally worth it; I really loved this one! The sauce was made with onion, butter, sausage, zucchini, salt, and fresh tomatoes. Then it was tossed with the pasta and some freshly grated parm. While it was cooking, I had the thought that mushrooms would be good, too, but because these recipes are so simple, I feel like I need to make them as written the first time to see what they're supposed to be. I will make this one again, definitely with mushrooms next time. After eating dinner and putting the kids to bed, hubby and I were craving something special for dessert. I'd been drooling over the recipe for Chocolate Cake Heart's Desire which Joanna posted (from the River Cottage Everyday cookbook) ever since she first posted, but we haven't had fancy chocolate in the house for ages! Luckily, we'd just been to the store and I'd remembered to pick up some Lindt 70%, so I was finally able to make this cake. I halved the recipe, and it provided us with a delicious dessert for two nights (with ice cream, of course). Yum! When my hubby walked into the kitchen tonight, looked up at the clock, looked at dinner on the table, and looked at the copy of Giuliano Hazan's Thirty Minute Pasta sitting on the counter, he said, "I think this book is worth purchasing ~ not just checking out from the library!" I'm sure many of us have had the experience of going to cook a "quick" recipe for the first time and having it take twice as long as it's supposed to, as you figure out the methods, realize too late what you forgot to prep, have meat that needs to be cooked in two batches. So I knew that my first foray into 30 Minute Pasta would be pretty quick, but I was not anticipating 27 minutes from walking into the kitchen to sitting down at the table. Kayte joined another cooking group: Thirty Minute Thursdays, and when she posted about it, I was intrigued. We are always looking for quick recipes for those kinds of nights (you know the type I'm talking about, right? 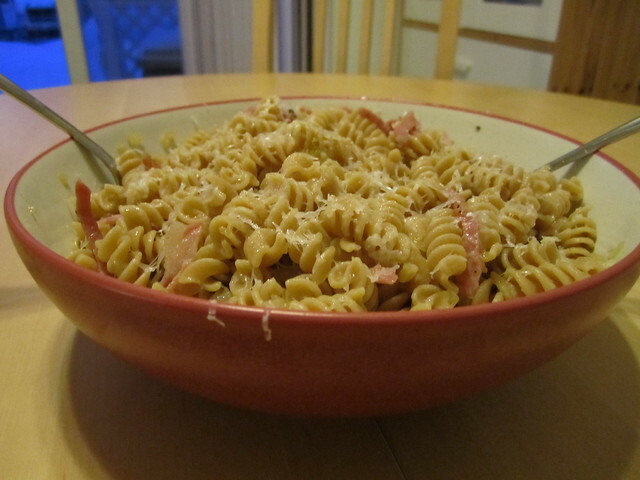 ), and pasta is pretty much never-fail in our house. However, I can't commit to cooking on Thursday nights. You see, Thursday nights and I just don't get along. For some reason, I'm up for cooking (an intricate dish, something thrown together, whatever) pretty much every Saturday, Sunday, Monday, Tuesday, and Wednesday, but for some reason when Thursday rolls around, I just can't get myself to walk into the kitchen. It took a lot of weeks of "What's for dinner?" arguments before we finally realized that they always happened on Thursdays, and thus Thursdays became hubby's night for dinner. Sometimes he makes one of his specialties: fajitas, tacos, eggs in a nest; sometimes he just goes and gets us a pizza. Whatever he decides, I take no responsibility for dinner that night, which always feels really good. Anyway, today was one of those days: didn't get home until midnight from our debate tournament and 18-hour work day yesterday, had to be back at school at 6:20 this morning to make sure the debaters got on the bus for day two of the tournament, then went to swimming lessons with the kiddos, followed by a winter festival at the little guy's preschool. It was big day, and I did not have it in me to cook dinner. Enter Thirty Minute Pasta! Hubby picked the recipe: Rigatoni with onions, pancetta, and pecorino. Besides those three ingredients, this recipe includes olive oil, salt, and pepper. That's it. And it was on the table in 27 minutes. The final dish was too salty for my taste. The pancetta is salty by itself, and then GH has you salt the pasta water (I only used one of the two tablespoons of salt he calls for) and lightly salt the sauce. Next time, I think I'll omit the salt from the sauce and go even lighter on the salt in the pasta water. But it was a tasty, quick dinner, and perfect for a night like tonight. I can't wait to see what the rest of the book has in store! Meet my husband. He is a guy who, when he saw this ingredient list: 2 pounds of whole-milk ricotta, 6 large eggs, 1/2 cup pecorino romano, 8 ounces prosciutto, 8 ounces soppressata, 1 pound fresh Italian basket cheese, 1 pound fresh mozzarella, 8 ounces capicola, knew this would be one of his favorite recipes in all of Nick Malgieri's The Modern Baker. This is my official recipe for the Modern Baker Challenge's journey into the savory tarts and pies section. My hubby's pick. I've already made (and loved) the ham, egg, and cheese tart from this section, and I'm really happy to be in the savory world after months of sweets. I couldn't believe the poundage of meat and cheese in this recipe, so instead of making a full batch (9x13 pan), I decided to make a half recipe and bake it in a 9" round pan. Size-wise, it seemed to work perfectly. The dough was made an hour ahead of time: a simple pastry dough with flour, salt, baking powder, eggs, olive oil, and water. I thought I'd miss the traditional pizza crust, but the pastry crust was surprisingly tasty. I had a slight difficulty with the dough; it was way too wet. I'm not sure that it's an issue with the recipe, however; my Cuisinart has been hiding little pockets of extra flour under the blade lately and all of my doughs have been a little wet because of it. I just kneaded in a bit more flour by hand, and after refrigeration, it rolled out pretty easily. The filling was made by layering a ricotta mixture (ricotta, grated romano, parsley, eggs, and pepper), the different meats, and the cheeses. I couldn't find fresh Italian basket cheese, so I used a combination of extra mozzarella and extra ricotta for that layer. NM says that it's "thoroughly Italian" to experiment with your own combinations of meat and cheese, so I was sure he'd approve! The pizza pie is baked for an hour and then cooled slightly. We had it for dinner last night with salad. The kids didn't like it at all, but that didn't surprise me; they're not fans of the texture of ricotta and never like any lasagna-type dishes I make. I thought it was very rich and a tad dry. I don't think the dryness is a fault of the recipe, though; the recipe calls for whole-milk ricotta and I just couldn't bring myself to buy a pound of it on top of all of the other high-fat meats and cheeses in this dish, so I subbed in low-fat. I'm sure that affected the final texture of the dish. As for the meat and cheese lover? He loved it! He had seconds last night and is happily gobbling up the leftovers for his lunches. I'm sure I'll be making this one again ~ by request. The second January bread for Mellow Bakers is golden raisin bread. We aren't big fans of bread with fruit in it; we didn't like any of the fruit breads from the BBA Challenge...cinnamon raisin walnut bread, cranberry walnut celebration, panettone, and stollen all ended up on the Not Likely to Bake Again list. This one started with a liquid levain build; I got Austin out a few days early, as he had not been refreshed in a very long time. It didn't take him long to get back on track. The second day was pretty easy. Mix bread flour, whole wheat flour, water, oats, salt, yeast, and the liquid levain together. Then add the raisins. My standmixer was not at all interested in incorporating the golden raisins, so I ended up kneading them in by hand. Then a rise, shape, and rise again. The proofs took a bit longer, as it's really cold here again. Surprisingly, we actually really enjoyed this bread! Hubby and I ate it warm out of the oven with butter last night, and had some toasted with butter for a second breakfast this morning. I love the combination of the slightly sour flavor, hint of whole wheat and oatmeal, and slightly sweet raisins. We actually might make this one again! Check out what other Mellow Bakers are making this January! Early this past year, I decided I might like a pasta roller for my Kitchenaid for a Christmas present. I had a few reasons: I really love learning how different foods are made; I figure that homemade almost always tastes better; I like to know all of the ingredients in foods that I feed my family. Also, my mother-in-law makes chicken and noodles for us every time she visits. I tried following her recipe once, but I really struggled with the homemade egg noodles; she rolls and cuts them by hand and I had a difficult time getting them thin enough . . . and doing it quickly enough so that the meal could be done in a reasonable time. Anyway, chatting with Kayte and Natashya on Twitter, I learned that they were also requesting pasta attachments for Christmas, so Kayte suggested that if 2010 was the year of bread for many of us, maybe 2011 could be the year of pasta! Happily, under the tree I found the pasta attachment (roller, spaghetti cutter, and fettuccine cutter), a pasta drying rack, and a ravioli press from my awesome hubby. Being someone who loves doing research and gathering information, I tried to find some books on pasta-making, hoping for the same love I feel for books on bread-making. I found many cookbooks specializing in pasta dishes, but none specializing in making pasta. I began to fear that there wasn't enough to learn about pasta. I was wrong! While I couldn't find a book on making fresh pasta, almost every pasta/Italian cooking book I looked in had a variation of "basic fresh egg pasta" ~ and they're all different! I tried two to start: one from America's Test Kitchen's Family Cookbook and one from Lidia's Italy. I mixed up both in my food processor and then finished kneading by hand. The next afternoon, I pulled out the dough made with Lidia's recipe. I rolled out the sheets of dough, which went even easier than the previous night, and stored them between layers of a damp kitchen towel, as I'd done with the ATK recipe. Disaster struck when I went to cut the dough. I was planning to make spaghetti but when I tried to put the first strip into the cutter, it just blobbed up. Nothing went through. So I switched to the fettuccine cutter. Got a couple of usable pieces, but mostly just giant blobs. It was so frustrating! And then I went to pull the next strip off of the damp towel. Totally stuck. We ended up cooking a couple of boxes of packaged rigatoni for dinner, along with about ten strands of fettuccine that made it through the cutter. I was too discouraged to even scrape the rest of the dough off of the damp towel, so I made my hubby do it. I did stop him when he went to throw it away, though, and had him put it in the fridge instead. One of our dinner guests said that when he used to work at a restaurant that used a similar roller for pizza dough, they had to use a TON of flour. Which is when I realized: duh! ATK has you store the rolled sheets under a damp towel because their recipe includes no moisture and the dough would dry out. But Lidia's includes more eggs and water and oil; of course it needed to be stored between layers of flour and not a damp cloth! Sure enough, when I was alone later in the evening, I pulled out the dough, rerolled it (using a lot of flour) and then ran it through the cutter. Beautiful, perfect fettuccine! Here is another batch, made tonight, served with Cook's Country's Sunday gravy: an incredibly flavorful spaghetti sauce made with leftover pot roast (from their newest issue). So lesson #1: use a lot of flour! This is where my bread-baking may get in the way of my pasta-making. I'm so used to using as little flour as possible to roll out dough and never adding any extra; I'm going to have to change that behavior to become successful with pasta! Our current section of The Modern Baker is savory pies and tarts. The moment I saw the recipe for ham and egg tart, I knew it would make a perfect breakfast treat! Last night, I whipped up the rich pie dough. It was a cinch in my food processor, and I left it to rest in the fridge over night. This morning (after the kids woke us up ridiculously early), the rest of the recipe came together quickly. I whisked together cream, milk, salt, pepper, and nutmeg, and then added in the eggs. NM lists the seasonsings (salt, pepper, and nutmeg) with no amounts; the recipe just indicates "season to taste, and season heavily." I wish there'd been some indication of where to start, as it took me quite a while to grind the spices, taste, grind, taste, grind, taste. Seriously, we loved this tart. It was a great second breakfast for the family, went over very well for a late lunch with bookclub, and will be finished by tomorrow. This is one of my top three recipes from this book so far (my other favorites are his scones and milk chocolate mousse cake). Several of my Twitter friends (Phyl, Kayte, Margaret, and Andrea) were Twitterbaking Nick Malgieri's praline pound cake last Sunday, and I was enjoying reading about their experiences. When I heard about and saw pictures of the results, I knew I had to join in! This is a surprisingly light pound cake with a very fluffy (and very delicious) batter. It was easy to mix up: all-purpose flour, a whole lot of butter, a lot of eggs, sugar, brown sugar, salt, baking powder, vanilla, bourbon, and pecans. The cake is supposed bake for 60 minutes. Mine was clearly not done, so I let it go another 10, and then another 10. When I finally took it out, it was a tad dry, and I realized I should've stopped at the 75 minute mark. But even baked five minutes too long, this was a really tasty cake, perfect with a cup of tea. I am excited to try the other variations as well! We had a lazy New Year's day ~ a sick little girl and freezing temperatures made going outside seem entirely unnecessary. Inspired by several people tweeting about a Modern Baker savory tart, I decided to browse through the next section of the book. I have a big sweet tooth, but I'm excited to be entering a savory section of the cookbook ~ especially one filled with so many egg-based tarts; I really enjoy quiche-y dishes. I didn't have the ingredients on hand for the corn tart that others were baking, but I did have the ingredients for the chicken pot pie, so I decided to make it for dinner. The stock uses chicken thighs, water, thyme, salt, and a bay leaf, and then carrots and onions later on. For the pie, you layer the chicken and veggies, followed by frozen veggie, and then the stock which has been mixed with cream and reduced. Finally, you make biscuits which get plopped onto the top, and the whole thing bakes for 25 minutes. The broth was yummy and the chicken and veggies both had a great flavor. Unfortunately, the biscuits never really browned, even though I left the pie in the oven for additional time; and when we cut into them, they were undercooked in the middle. I was also surprised by how liquidy the pie was; we had to use a slotted spoon to extract all of the meat and vegetables. So I probably won't make this one again. I have a stand-by pot pie recipe, which I make once every couple of weeks and which we love. While it does take a bit more work with chopping and sauteeing, it really doesn't take any additional time. On to the next recipe! I was spoiled at Christmas this year with new and fun cooking and baking gifts. My favorite one? My hubby ordered from King Arthur Flour! What did he get me? I didn't even really care . . . it just meant so much that he a) knew how much I wanted to order from KAF and b) did it all by himself without asking me anything about it! I've filled a shopping cart more times than I can count, but never could commit to actually submitting an order (in addition to not being very mellow, I'm also pretty frugal . . . my mom would say "cheapskate"). I was so excited to open a stocking stuffer and find the KA Vietnamese cinnamon that I've been coveting. And under the tree? A pullman pan! My hubby knew I'd been considering a pullman pan when I made the Horst Bandel Pumpernickel, but I ended up just baking it in my dutch oven. Anyway, imagine my excitement when the January Mellow Baker breads were posted and pain de mie, aka pullman bread, was on the list! Of course I had to bake it immediately. This is probably the easiest bread I've baked from Bread so far. I started mixing it at about 8:00 this morning, and we were snacking on it by 1:00. The dough consists of bread flour, unsalted butter, salt, instant yeast, powdered milk, and water, all mixed and kneaded. My scale (grrrr!) got me again and errored right in the middle of pouring water, so I just guessed how much to add. During mixing, there was flour at the bottom of the bowl, so I added more water. My KA was still working hard, and after the kneading time, I realized that I probably should've added even a bit more water as the dough still seemed rather dry. Next time, I'll do an official mise en place and weigh my water ahead of time! The dough proofs, is folded, proofs again, formed into loaves, placed in the pan, rises a final time, and goes into a 400F oven. The dough is supposed to be 1/2 inch from the top of the pan when it goes in; mine wasn't close, but it definitely seemed proofed and I didn't want to overproof it, so I put it into the oven. It rose considerably in the oven and touched the top of the pan, although I didn't get those nice square corners that pullman loaves are famous for. No matter, it was still tasty and we snacked on the little loaf all afternoon. I brushed it with melted butter when it came out of the oven, which we really enjoyed. I wasn't sure if that was a good move with the pullman loaf, so I didn't try it. Maybe next time. I also think I'll add some white whole wheat flour next time to improve the whole grain content of the bread . . . but there will definitely be a next time, and I'm even more excited that hubby got me that pan! Several of the people who I know from various baking challenges started changing their Twitter avatars each month around a certain theme. Kayte (Grandma's Kitchen Table) invited me to participate in the avatar baking for 2011. Each month, one of us chooses a chef. The rest of us cook or bake one of that chef's recipes and change our twitter avatar accordingly. I'm so excited to participate! I think there are only a couple chefs from whom I've cooked before, so I can't wait to be introduced to new chefs, new recipes, and new cookbooks! Anyway, Kayte's pick for January was Thomas Keller. I had never heard of him, but it seems that many people received his cookbook Ad Hoc for Christmas. I searched online and found a bunch of recipes that sounded really amazing. I'm especially excited to try his oh-so-simple recipe for roast chicken later this month! But it was something like 4F outside yesterday, and I didn't want to leave the house to buy any ingredients, so I picked a simple recipe for which I had all of the ingredients on hand: caramel corn! The recipe calls for 1 cup of unpopped popcorn, but I didn't feel like there was enough caramel for all of that, so I ended up making a double batch of the caramel. The first batch was awesome! So tasty, in fact, that hubby, baby girl, and I ate almost the entire batch while I was making the second batch of caramel. The second batch of caramel didn't turn out (totally my fault; I didn't cook the caramel long enough), so it tasted more like corn drizzled with sugar syrup . . . never fear, we ate it anyway! 1. Place the sugar, corn syrup, and water in a large saucepan (I used my dutch oven) and heat over medium-high heat. Stir constantly for a couple of minutes until the sugars have disolved and the mixture begins to boil. 2. Let mixture boil (without stirring) for five minutes or until the caramel turns a light golden brown. 3. Add baking soda and butter to the caramel and stir until the butter is melted. Happy New Year, everyone! Can't wait to see what delicious things are baked in 2011!